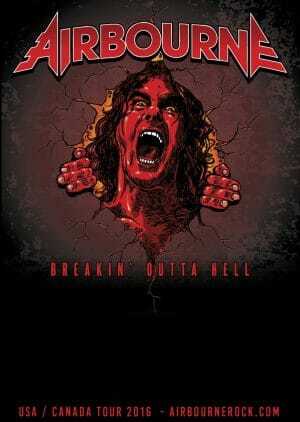 Great news for Airbourne fans as the Aussie foursome will be releasing their fourth album entitled Breakin’ Outta Hell sometime in the future as well as embarking on a tour of the US and Canada in the fall of 2016. 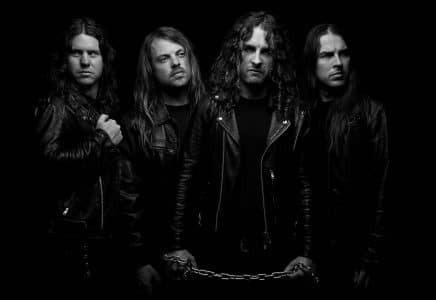 Airbourne – unswerving, clenched-fist champions of the hard rock cause- have confirmed their new album title, Breakin’ Outta Hell, also the title of the first single/video, along with a headline tour of North America for September and October; the tour kicks off in San Diego on September 12 and concludes in Baltimore on October 14, taking in 21 shows along the way. Driven by a formidable work hard, play hard ethic, the Australian outfit (led into action by brothers Joel and Ryan O’Keeffe, vocalist/lead guitarist and drummer, respectively; guitarist David Roads and bassist Justin Street complete the line-up) have spent the past 10 years establishing themselves as a true force of nature: living on the road, selling out major venues and appearing on bills with some of rock’s most legendary names, and this latest North American run will only add to their reputation for incendiary live performances -maximum energy, maximum entertainment.